Greentech | Hawk Research Laboratories, LLC. 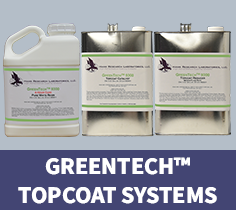 GreenTech Topcoat is a low VOC 4-Hour cure, two-component urethane system used for all kitchen, bath and architectural surfaces. GreenTech 9300 topcoat incorporates the same outstanding dry film performance characteristics of the GlasTech™ 9000 family of topcoat systems, in a formula which is VOC compliant, even in tough compliance areas like California’s South Coast Air Quality Management District (According to SCAQMD Rule 1113, Amended February 5th, 2016).